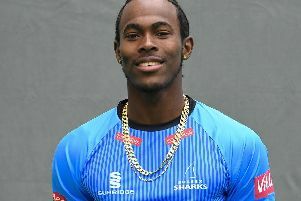 A seventh wicket stand of 110 in 25 overs between Ben Brown and Chris Jordan rescued the day for promotion-chasing Sussex against Leicestershire at Hove on the opening day of their vital Specsavers County Championship second division match. Until their stand Sussex had not made the most of a strong position with a number of batsmen getting out when well set against a depleted but spirited Leicestershire attack. Sussex, who closed day one on 323-8, had made a positive start after winning the toss. Their new-look opening partnership of Phil Salt and Tom Haines put on 79 for the first wicket at virtually four an over. After a disappointing defeat on a difficult pitch at Lord’s third-placed Sussex picked an unchanged side – but pushed regular opener Luke Wells down to No 3. Salt scored a typically expeditious 44 from 60 balls, with eight fours, before he was well caught and bowled by Ben Mike, low down to his right. Mike is making his first-class debut and impressed with his action and pace bowling downhill from the Cromwell Road end. He finished with three for 57. Dieter Klein is playing his fourth championship match of the season but is still waiting for his first wicket. Leicestershire, whose own promotion bid had fallen away in defeats by Kent and Gloucestershire, were fielding a weakened attack without the injured Gavin Griffiths and Zak Chappell. Haines reached his fifty when he guided Mohammad Abbas to the third man boundary for his tenth and final four. On 56 he was caught in the same area as he attempted a square drive. Sussex were 126 for two in the 37th over. Wells looked as if he had been batting at No3 all his life. He went down the pitch to drive spinner Callum Parkinson back over his head for a flat six. But Leicestershire hit back on 140 when Harry Finch was lbw to Raine for four. Wells reached his fifty from 96 balls, with four fours and a six. But he was fourth out at 188 when he pushed forward to Neil Dexter and was caught behind. Luke Wright, with some forceful drives, looked keen to make up for his pair in his previous outing. There were four fours in his pugnacious 27 but then he was bowled attempting to pull a ball that kept low. When David Wiese was well caught in the gully for a second ball duck Sussex were 204 for six Sussex had not made the most of their early advantage. But then captain Brown (60) and Jordan (52 not out) came together to provide the most resolute batting of the innings. Brown has been his side’s most dependable batsman this season, although he had to survive a prolonged appeal for a slip catch by Mark Cosgrove after reaching his half-century.